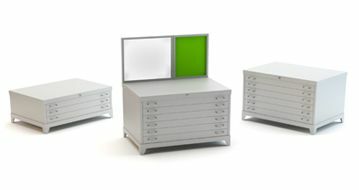 MAXSTOR manufactures and supplies a unique range of Drawing File Cabinets. It is a piece of furniture with shelves, drawers, etc., for holding or displaying items. Also, it is called is a piece of office furniture usually used to store papers, important documents in file folders. Our Drawing Filing Cabinet and drawing storage cabinet is wide & adequate enough to store drawings. With rich experience of engineering products and deep knowledge of manufacturing processes, we understand the significant uses of drawings. For the precise production perfect drawings play the vital role. About all engineering, sectors are making use of CAD drawings. Sorting of the drawing is also as important as to keep them safe. So to add value for the storage of drawings, we have designed and developed the Drawing File Cabinet Manufacturer India. It is available with partition option for sorting A2, A3, AND A4 papers. It also contains the whiteboard and pin board. We provide 3 drawers to 6 drawers which are stackable one on one. Load capacity up to 75 kg UDL. Several combination options due to optional base and tops.